No, I will not start complaining about the rain. I am honestly glad about the constant pouring as the hot and dry summer and autumn left nature thirsting for water. 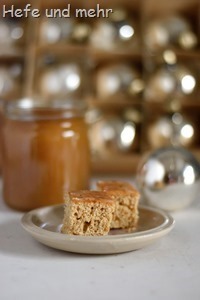 But my foodblogger heart is still grumbles a little bit about the dull light we have. It is rather bad for taking pictures. But that’s what high Iso and the golden side of my reflector is for, isn’t it? And when it’s raining cats and dogs it is the perfect weather for baking bread. 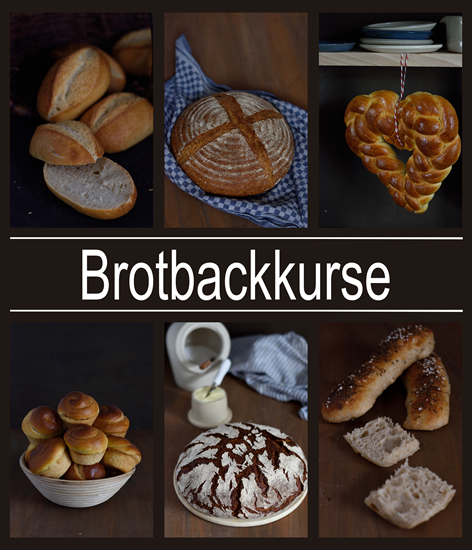 And so I spent the last sunday with baking another regional bread. 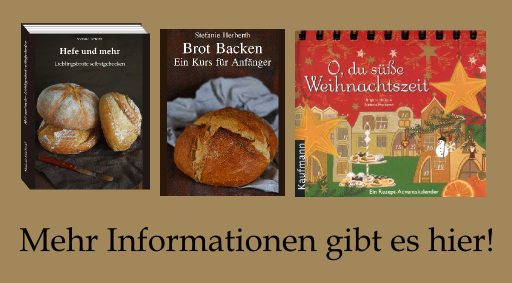 The Kassler Bread (or short Kassler) stems – as its name suggest – from the city Kassel, but is nowadays baked often in the Rhineland, too. 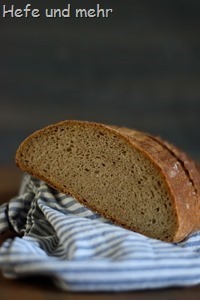 It contains about 30% Rye and 70% Wheat flour and it’s a kind of bread I call lovingly “everyday bread”. 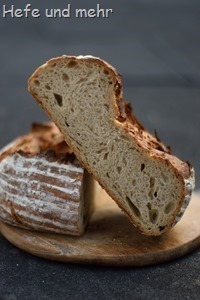 It is flavourful and goes well with every kind of topping: from honey to cheese, everything fits with this kind of bread. Autumn means always potato time for me. 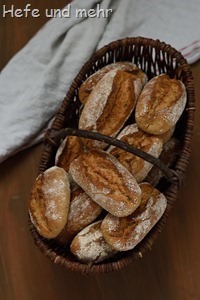 And even after this hot and endless summer, when we had to harvest them already in august due to the drought, I hunger for the first loaf of potato bread. Here – in the region around cologne – potatoes are called Ärpel or Erpel. This dialectal term is a short form from “Erdapfel” (literal earthapple). And so is an Ärpelbrot nothing other then a potato bread. 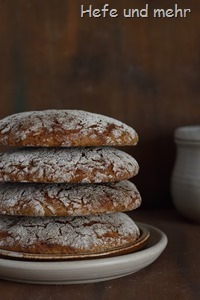 These Variant is in some points similar to the Oberbergischen Ärpelbrot but is baked with a rye poolish and yeast. And so it is a variant that works well for bread baking beginners too. 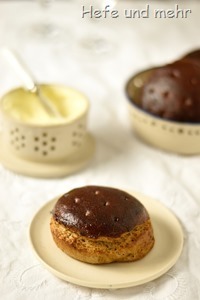 It is a aromatic bread whit crisp crust and tender crumb. 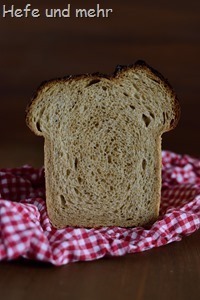 For me, it is the right bread to eat it – thickly slathered with Plum butter – on a cold, misty autumn morning! Slowly I find back into my everyday life after summer holidays. And summer seemed to be endless this year. I can’t remember when we had such a long period of hot and dry weather. But now, beginning of september, I feel that autumn is shyly knocking on our door. On my daily way to work I can see how mist is now filling the valleys around me. These are mornings which wake the memory of my favourite poem from Eduward Mörike. 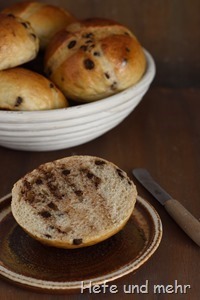 A memory of the fading summer is this recipe for three grain rolls. 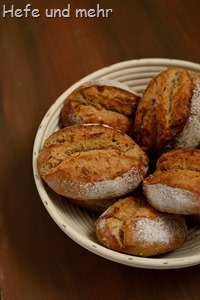 Made with einkorn, rye and wheat flour the rolls have a delicious nutty flavour. A bit of potaote flakes helps to keep the crumb moist and tender. 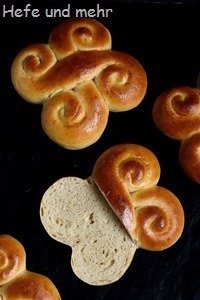 They are nourishing rolls packed with flavour and a good portion of whole grain flour. And so they were the perfect snack on our long summer trip to the Normandy.